The inaugural class of Apple Entrepreneur Camp attendees arriving at Apple Park. Apple revealed the information on Monday, during the first session of Apple's Entrepeneur Camp. 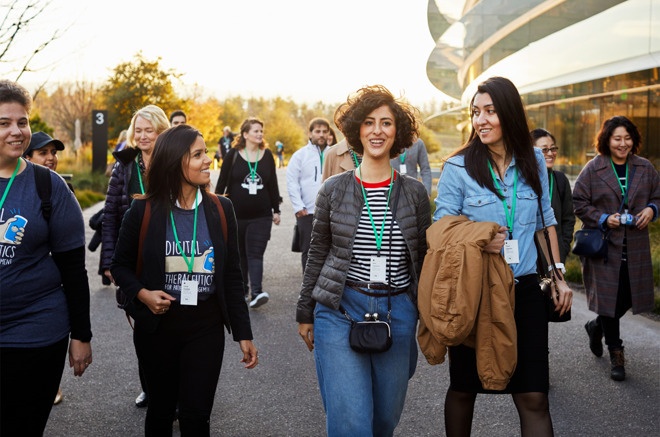 Apple's Entrepreneur Camp is a two-week technology lab where participants work one-on-one with Apple experts and engineers to significantly accelerate their apps. The program also includes sessions on design, technology and App Store marketing, as well as ongoing guidance and support from an Apple Developer Relations representative. "Apple is committed to helping more women assume leadership roles across the tech sector and beyond. We're proud to help cultivate female leadership in the app development community with the new Apple Entrepreneur Camp," Apple CEO Tim Cook said when the program was launched. "We're inspired both by the incredible work that's already happening, and what's sure to come," he added. The curriculum will help developers take advantage of Apple technologies, including optimizing for the A12 Bionic chip, integrating Core ML, and building new experiences with ARKit. Each participating company will also receive two tickets to the 2019 WWDC and complementary membership to the Apple Developer Program for one year. Apple's Entrepreneur Camp will hold sessions on a quarterly basis, with up to 20 app companies accepted for each round. To be admitted to the program, app-driven businesses must have at least a prototype, must be founded, co-founded or led by a woman, and have at least one woman on the product development team. "In the past, starting a small business often meant having to invest in overhead, inventory or retail space. Today, a world of opportunity opens up with some coding skills and an entrepreneurial spirit," said Apple's senior director, Worldwide Developer Marketing and executive sponsor Esther Hare. "The App Store is the new digital Main Street, and creative developers are tapping into the vast potential of the global app economy. We hope that this program helps to inspire women around the world to learn to code, join the iOS development community and share in the thriving app economy." The apps selected for the first session of Entrepreneur Camp are: Bites by Warehouse Apps LLC; Camille by Ohhh, Inc.; CUCO: Lembrete de Medicamentos by CUCO Health; Deepr by Mental Mobile, LLC; D'efekt by Tatevik Gasparyan, Nan Toumanian and Vahagn Khachikyan; Hopscotch by Hopscotch Technologies; LactApp by LactApp Women Health; Pureple by Iceclip LLC; Statues of the La Paz Malecn by Estudio Chispa; WeParent by FamTerra Inc.; and Seneca Connect by Seneca Women. How exactly did Apple phrase it (the "doling out"/"paying out")? If they aren't careful they could undermine their argument in court about their role with respect to app buyers and sellers. Therefore, I'm sure they characterized it as other than "Apple paid developers." Greedy company, Apple should provide the platform for free. Apple should be helping everyone be successful not just focusing on one group, just because you through money and resources at people does not mean they will be successful or they may have other priorities in life. "In the past, starting a small business often meant having to invest in overhead, inventory or retail space. Today, a world of opportunity opens up with some coding skills and an entrepreneurial spirit,"
The money they are keeping is covering those costs, this is the point the complainer do not understand. Most of these people have no clue how hard it was to get a product like software to market and make sure the right people saw it and purchased it. Apple is doing much of the heavy lifting that many of the companies do not have to worry about this stuff. Follow apple's guideline, write code, publish it to the App store and consumers will come. The question is 30% more than enough to cover all the heavy lifting costs. Try doing it yourself and see what it cost you. Also, at first none of the carriers were on board with the App Store and Apple had to pave the way for everyone. I found it. "Since the App Store launched in 2008, developers have earned $120 billion, with more than a quarter of that in the past year alone." Developers have earned is very different than "Apple has doled out" or Apple has paid. The carries had nothing to do with it, they had online store for people to buy ring tone sand simple games, Carries thought this was the next way to they syphon money out people wallet and give them nothing in return. You mean like AT&T that once blocked FaceTime and iMessage because it would/were cutting into their cash cows? Thank Apple for releasing the cell user from the stranglehold that the carriers had. I'm glad that someone pointed this very important point out. Apple has created an ecosystem, enabling technology, tools, services, and a marketplace for independent developers to sell their wares. Apple gets a cut of the sales for the use of their systems and services that they provide to developers and developers keep the rest for themselves. To put it in terms that sound like Apple is altruistically gifting payments to developers is insulting. It's a storefront. I don't know why anyone thinks that Apple is taking advantage of developers with this arrangement. If Apple wanted to, they could take a more traditional approach, like Walmart, by purchasing app "products" from developers directly (and at drastically discounted wholesale prices) and reselling these products through the app store at prices determined by Apple. Such a "high touch" transaction model between between developers and Apple would likely result in a tiny number of apps available for purchase through Apple compared and at much greater app costs to consumers. It would be like the 1980s all over again, with the same result, but with exponentially greater piles of dead one-app storefronts being birthed and dying every month in total obscurity. Apple's current "low touch" model may not work best for the tiny fraction of developers who can survive on their own in a high risk business, but it creates an incubator and low-risk path for tens of thousands of developers, who would otherwise be totally invisible, to get a reasonable crack at creating a decent start-up business without remortgaging their house and draining their retirement savings before they sell a single copy of one app. Given the choice between making a system that's easier for the little guy/gal to get their toe in the door versus serving the needs of already established software vendors, who really don't need a lot of help, I think Apple's App Store favors the former (little guy) while not imposing too much of a burden on many of the latter (big guy). I happen to think it's a pretty good strategy for the greatest number of stakeholders and applaud Apple's approach. A good example of a power distribution this. Apple has paid out 120B to devs, now imagine that you are in the top 10% of devs, or just at the 10% mark. Could you live off that? I doubt it. Interesting question. First off, most "developers" in the App Store are companies not individuals. And clearly being at the very top of the charts is very lucrative. So the question is, how steep is the drop off? I would imagine that an app among the top 10% of downloads would easily generate $1M/year in direct and indirect revenue, but who knows. It would be fascinating to have the raw data. Apple often uses the term remit (or some variant thereof) to refer to it making payments to app developers. But Apple saying that it pays developers wouldn't undermine its legal case in Apple v Pepper. Apple doesn't deny that it sells apps to iPhone users. Apple acknowledges that it does so, as an agent of app developers. So there's nothing contradictory in it collecting app sale proceeds, keeping some portion of them, and then giving what's left to developers. Apple's legal position, when it comes to the standing issue which the Supreme Court is currently considering, is that plaintiffs don't allege that it monopolizes apps. Rather, according to Apple, plaintiffs allege that Apple monopolizes distribution services. And when it comes to distribution services, it sells those to app developers. So, under Illinois Brick v Illinois, iPhone users don't have standing to sue Apple because they are indirect purchasers (of what is monopolized). Apple's position is that the flow of funds doesn't matter. What matters is who makes the pricing decisions when it comes to app sales. To the extent Apple's 30% commission affects the price of apps, it's because of app developers' decisions to pass along the cost of that commission.